The other day I noticed the bunch of bananas I recently bought -- all seven of them -- turning brown. Obviously this calls for a loaf of banana bread, which, in my book, calls for four bananas. I decided to mix up two batches of banana bread batter, each with three and a half bananas. I made one regular loaf (because that's what the husband prefers), and then did something a little more interesting with the other batch. I also had two apples hanging around. So I chopped them up, threw 'em in a bowl with a little brown sugar, tossed them into my awesome banana bread batter, made muffins, and topped them with cream cheese frosting. Are they muffins or cupcakes? Ummm. No. Maybe shouldn't try to put the two words together in this case. So we shall have to call them "Muffin Cakes"! All I know is they came out quite delicious, so I decided I should share them. Disclaimer #1: I am not a foodie or a food blogger, nor a food photographer. I have, however, been spending more time in the kitchen lately and not hating it, which you can see evidenced in some of my recent Instagram pictures (because sharing what you're eating on IG is the thing to do). Disclaimer #2: I did not create the recipe I use for banana bread. Someone gave it to me years ago and I am unable to recall who or when. But trust me, I have made countless loaves with this recipe and if you do it the way I say you should, it will come out great. I've noticed that most banana bread recipes call for only two or three bananas. I don't understand this, because not only do they not have a good amount of banana flavor, using less than four bananas tends to make the bread come out kind of dry. But then, I enjoy a very moist, dense flavored quick bread that you don't need to spread butter on. Maybe you don't. You decide. Now I shall give you two -- TWO -- recipes for the price of one! Directions: Preheat oven to 350. Peel bananas, toss them into a mixing bowl and mash them up really well. Add the rest of the ingredients in order listed, mixing as you go. Pour batter into one greased loaf pan. Bake for up to an hour. Notes: 1) If you're hand mixing the batter, it might be best to beat the egg before adding it. If using a stand mixer, just put the egg in and let the mixer do the work. 2) You can get away with less banana, if you want. 3) Of course you can also add in things like walnuts, chocolate chips, blueberries, apples, etc (1/2 - 1 cup). 4) Check for doneness after 50 minutes. Directions: Preheat oven to 350. Prepare banana bread batter. Peel, core and chop 2 apples and put them into a separate bowl. Add brown sugar to apples and mix to coat. Add about 3/4 of a cup of the apple mixture to banana bread batter and mix. Fill greased or lined muffin cups 3/4 full. Top filled cups with a few more apple pieces. Bake at 350 for 25-30 minutes. 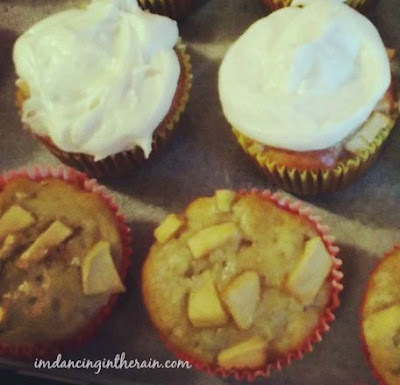 Remove from muffin tin and let cool. Top with cream cheese frosting. 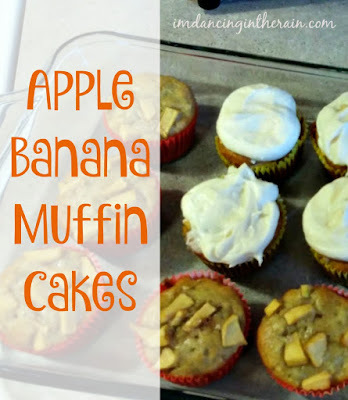 Notes: 1) I topped the muffins with more apple pieces because I thought the ones added to the batter might sink to the bottom, and I hate that. 2) You could totally make these with any add-in. 3) I made cream cheese frosting myself, but you can also buy it premade. These are so yummy! Seriously. 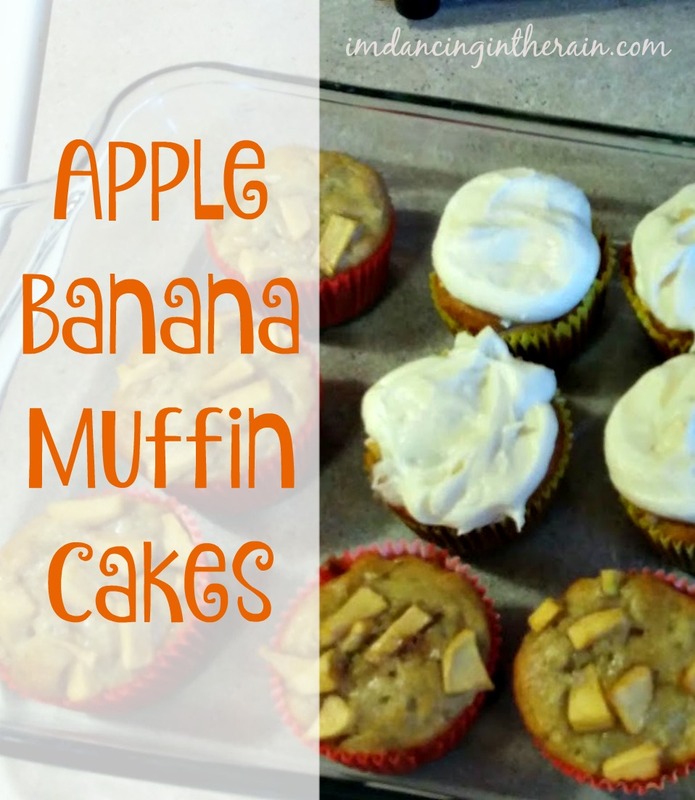 Let me know if you try making "______ Banana Muffin Cakes" and how they turn out!